Lee Metford M 88 rifle. Serial number 125 on pommel. Very good bright finished double edged blade with some fine peppering near to the tip. Crown VR 1'90 on ricasso. There are more issue dates: '94, '95, '97, '98 and '99, surrounded by several Enfield inspection markings. Reverse side is marked /I\ over WD. another Enfield mark. a bend test mark, a obsolete mark and a taken out of service mark. Another Enfield mark on the blade spine. Very good bright finished pommel with serial number and crossguard with muzzle ring. MRD 16.5 mm. Blade tang is marked wit a large G. Very good wooden grips showing acceptable wear. Fixed with two small brass rivets and one large. Oil hole in grip. Excellent black leather scabbard, /I\ EFD marked (= Enfield made) and '95 dated. Fittings with Enfield inspection markings. No dents to the fittings and all stitches intact. This model was approved on June 20, 1889 and only 25.000 were made at Enfield. Most if not all of these early MkI bayonets encountered today are in very ordinairy condition and often have damage or wear to the grips. 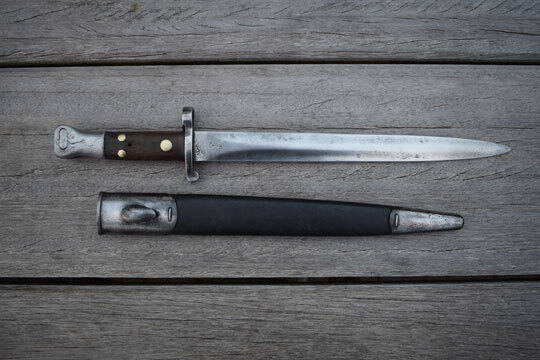 This is a very rare bayonet.